For the benefit of readers who have not read the previous page, American Landmarks, let me recap briefly the dilemma in which I found myself on the long Easter Weekend of 2011. I had discovered a bad rear tire on the Goldwing and saw little hope for remedying the situation before the Tuesday after the Paschal observance. An SOS that I posted on one of my online Goldwing forums ultimately put me in touch with a fellow rider in the same town (Boulder City, NV) where I encountered my problem. The tire situation was not critical in the short term, and Matt Sheen urged me to go ahead with my scheduled Sunday trip to Death Valley while he took care of setting up my repairs by providing me with a nearly new tire he had recently removed from his Goldwing. His mission was complicated by the fact that he, himself, was leaving on a motorcycle trip the next morning. One of the gratifying aspects of motorcycling has nothing whatsoever to do with sitting on the machine and watching with fascination as the scenery flashes by. It isn’t the mechanical or logistical problem solving or the outrageous duds we get to wear. For me there is an irreplaceable sense of community and camaraderie that motorcycle riders enjoy which is like no other I’ve found. I’ve talked about some aspects of that relationship on a couple of other pages, at New Friends and Red Necks and at Biker Buddies and Freeway Friends. When I was writing both of those pages, I was hard pressed to find a first person example of the attitude and mindset I was trying to describe. An astonishing little tourist town, complete with hotels and casinos about halfway between Las Vegas and Death Valley. 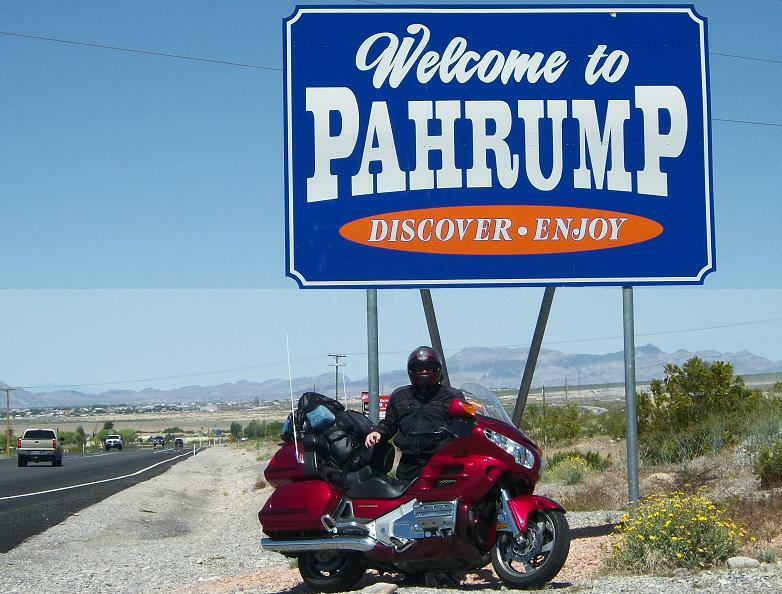 The magic of it blossomed into my riding repertoire when I rolled into Pahrump, Nevada, on the Tuesday morning after Easter. At Furnace Creek I had bought just enough overpriced gasoline to get me to this first sizable town on my return run to Las Vegas. After I tanked up in Pahrump, I grabbed a breakfast break at McDonald’s to take advantage of the free WiFi and a strong cell phone signal. I needed to catch up on my communications and post some Death Valley pictures for my friends who were following the trip on Facebook. My first call was to my voice mail box at T-Mobile. There was only one message, but it was the only one I was interested in. Matt Sheen had been unable to reach his mechanic to set up the tire swap; the shop was closed on Easter Monday. But my industrious new friend–who had to get on the road on Monday for his own vacation ride–left a voice message at the shop and sent a fax detailing exactly the arrangement he was trying to make on my behalf. His voice mail gave me a phone number, which I called immediately. Now remember, on Saturday evening my plea for help resulted in a reply from hundreds of miles away, from a person I had never met. He instructed me to call another person I had never met in the town where I had discovered my problem. And now that second person was instructing me to call yet another person I had never met to find out about an arrangement I had no role in formulating. Call me a cynic, but that just sounds like a plan for disaster. Instead, it was a formula for sheer genius and service beyond the bounds of duty. My call went through to Green Valley Motorcycles in Henderson, Nevada. Henderson is conveniently (for me) located between Boulder City and Las Vegas. It’s owned by Mike Klein, a first class, certified, Goldwing mechanic who is the official wrench jockey for a number of area motorcycle clubs and riding groups. The office is run by his wife who told me to make tracks for Henderson and promised that Mike would interrupt his work rotation to get me in and out as quickly as possible. That turned out to be just under an hour–with a nearly new rear tire, balanced and ideally pressurized for the resumption of my ride. I still smile–even chuckle–when I think about the saga of my motorcycle tire emergency in the wilds of the desert. There’s a lot of pioneering fortitude still kicking around out there in the land of sand. And it’s marvelously layered with kindness, compassion, and true grit. Almost two weeks later, when I was safely back home in Atlanta, I called Matt–whom I still had not met–to settle up for the cost of the tire. I am too embarrassed to tell you how generous he was. It’s this kind of stories, reported again and again on motorcycle chat boards across the country. that have prompted me to list my name, phone number, and email address with the riding groups I frequent online. They know my good will, my time, my tools, my motorcycle trailer, and–if need be–my family’s guest room are all available to take the loneliness out of trouble on the road. My plan had been to leave the Las Vegas/Henderson/Boulder City area, to ride up to the shores of Lake Meade and spend the night there before heading north to the fabled national parks of Utah. The attraction of names like Zion and Bryce Canyon and Arches and Canyonlands burned hotly in my mind. But plans are only that, and they’re made for the changing. I had gotten in and out of my tire change service call so quickly that hours of riding daylight remained ahead of me. I did ride up to the Lake Mead campground, but when I got there the sun was still high in the sky, and the roadway north beckoned irresistibly. Please join me for my ride From the Desert to the Land of Mountain Wonders. Love your blog. I have been a lifelong biker and always wanted to sail, at least once. I’ve had a health scare lately and now it’s really on my bucket list, sailing that is. Also, riding whenever and wherever I can. Thanks for taking the time to put your thoughts into words. It’s nice to hear from you, Ray. I wish you all success in finding access to some sailing adventure. I could talk for hours about the similarities to motorcycling and for hours more about how different the two experiences are. But–for me at least–they touch the same pleasure centers and render similar rewards of achievement and satisfaction.